We could all do with a holiday every now and again, so why not set sail to Millionaires Island? There's sun, sea and sand to accompany wild pool parties – not to mention the Mega Progressive Jackpot and a whole heap of bonus features. If you've ever spent any time thinking about what you would do as a multi-millionaire (and let's face it, you have) then you've probably got a good idea of how you'd spend your time. Maybe you'd get your own treasure island out in the middle of the ocean? Maybe you'd go deep-sea exploring for treasure? Or maybe you'd become a poker pro, and spend your time playing cards? Millionaires Island is a place where you can do all of those things and more – and at the end of it you just might be able to fulfil your fantasies by winning the Mega Progressive Jackpot. Your vacation begins with a look at a beautiful blue ocean shimmering before the lazily waving palm trees of a tropical island. Pleasure-boats and yachts are abundant on the crystal-clear waves and the party music begins – you've arrived on Millionaires Island. Time is money, so let's not waste any. 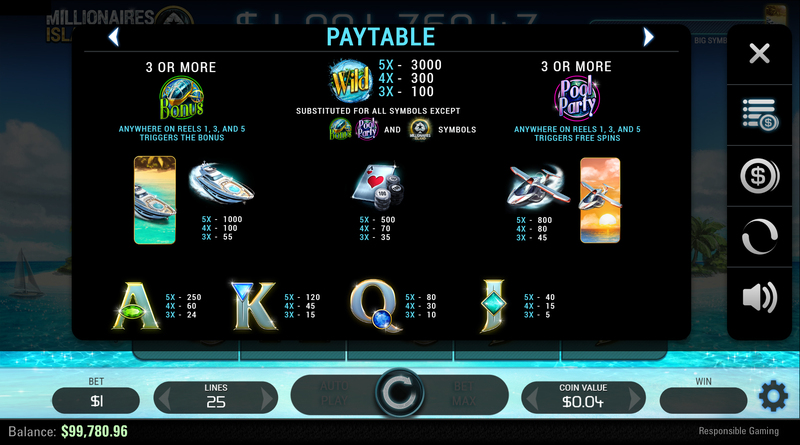 We know why you're here: you want to know about the awesome Mega Progressive Jackpot. Just land five Millionaires Island symbols anywhere on the reels and the Progressive Jackpot prize (at least £1 Million) is yours – instantly. 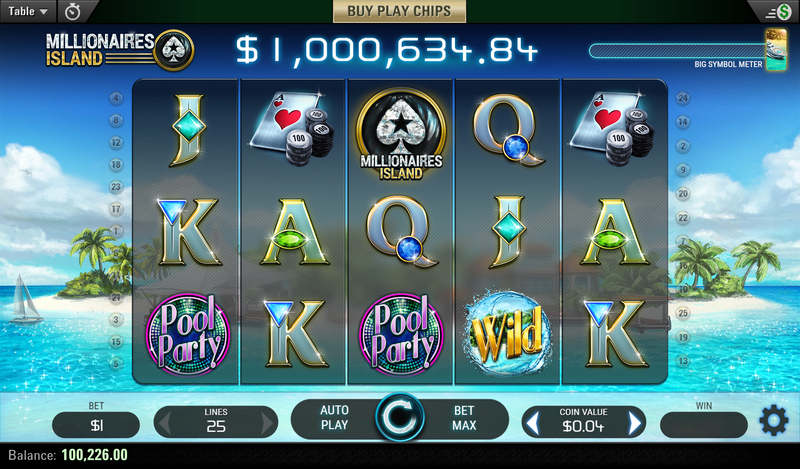 Millionaires Island has lived up to its name and made millionaires of several PokerStars Casino players. They say you have to spend money to make money, but when you're staying on Millionaires Island that's not necessarily true. Any bet at any stake can trigger the Progressive Jackpot – even if you're using a Free Spins Bonus. 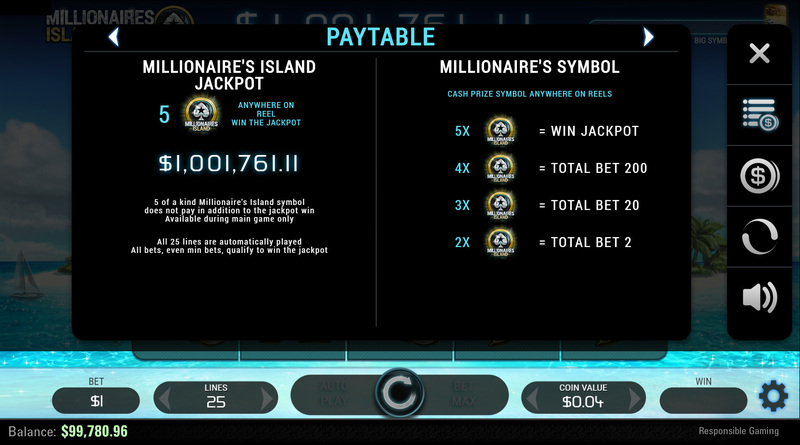 However, you don't need to win a million dollars to have fun playing Millionaires Island; the game has a wealth of bonus features in addition to the Mega Progressive Jackpot. If you hit three Pool Party scatter symbols on reels one, three and five then you'll trigger the Free Games feature. This will award you between three and seven free games at your current stake, with a random wild feature that adds up to five wild symbols to the reels on each spin. Want more? Then dive in to the Submarine Bonus Round, triggered when three or more Bonus symbols appear on reels one, three and five. Here, you must select the level of risk you’re happy with, ranging from Low, Medium and High Risk. These three risk modes award up to ten picks for each with different multipliers: Low earns up to 10x, Medium earns up to 30x, and High earns you up to 500x per pick. Once you've chosen your risk level, choose one item out of three to reveal the prize. Wins in this round are added to your payline wins in the main game. Note that the Submarine Bonus cannot be triggered during the Free Games feature. Finally, you need to watch out for sharks in the waters of Millionaires Island – card sharks, that is. Activated when an ace card symbol appears in the centre reel position, the Card Bonus can result in a quick and easy win. You’ll be prompted to pick two cards to win a poker hand in an exciting, neon-tinged mini-game. All prizes are multiplied by your total bet. The Mega Progressive Jackpot is seeded at £1,000,000 and converted into USD at the most recent exchange rate. The Progressive Jackpot is funded by player bets with 2.2% of each bet contributing to the prize; there is no ceiling on the Progressive Jackpot. The Return to Player (RTP) for Millionaires Island is 96.57%. Overall Opinions: Who Should Play Millionaires Island? If you've ever dreamed of joining the jet-setting elite, perhaps having your own private island for fun in the sun, then this game will certainly appeal. Millionaires Island is a sensational, sun-drenched Slot with the opportunity to win a fortune. Even for those with their head firmly outside of the clouds, Millionaires Island is well worth a spin. The mellow music and tranquil, tropical atmosphere makes it a great game for relaxation – just like a sun-kissed island should be! If you’re ready to take advantage of Slot with many bonus features and the chance to bag a huge win, then set sail to Millionaires Island today.